Stamp for Wisconsin created during or after President Calvin Coolidge's 1928 summer visit to Wisconsin. President Coolidge spent the summer fishing on the Brule River, with a high school in Superior serving as the vacation White House. 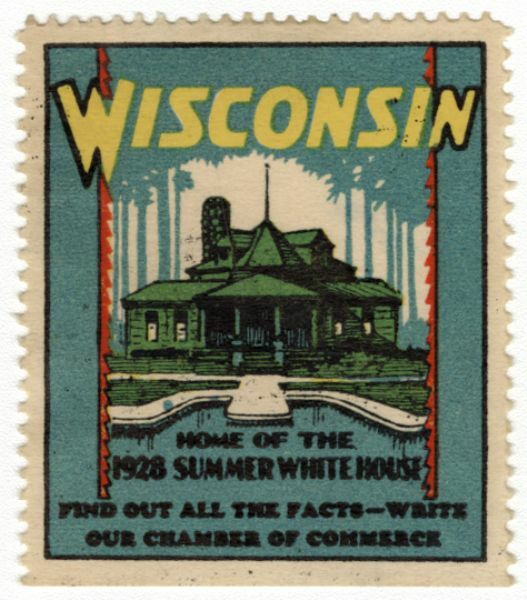 The stamp text reads: "Wisconsin Home of the 1928 Summer White House. Find out all the facts—write our Chamber of Commerce." Stamp also includes an image of the Summer White House and pier.